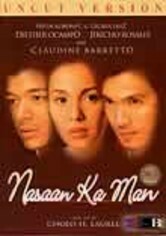 For Nyoy's (Angelo Ilagan) birthday, his friends hire prostitute Melba (Jacklyn Jose) to take his virginity. But after finding out that Melba is closer to middle age than her 20s, the guys all ditch her, except for Nyoy, who's inexplicably drawn to the older woman. Over the course of one magical night, Nyoy and Melba establish an intimate relationship that neither will ever forget.